Liberty EAS Solution - Intrusion Detection - Checkpoint Systems, Inc.
Liberty builds on next-generation digital RF electronics from the global leader in RF-EAS and RFID. 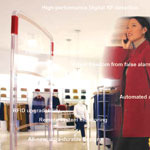 The Liberty family of antennas is engineered to meet retailer needs for ultra-reliable detection and alarm analysis as well as providing ability to migrate easily to RFID technology. High-performance RF digital-signal-processing technology filters interference to deliver superior tag detection and virtually eliminate false alarms. Liberty antennas can be custom configured for unique environments. Independent antenna alarms allow easy alarm identification. System-indicator lights eliminate the need for manual test checks. Durable antenna packaging flexes on impact and protects electronics from dust and cleaning agents.